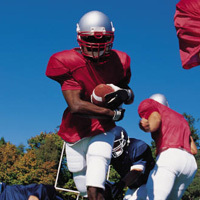 A significant study has found that the deleterious effects of traumatic brain injury in American football players can be mitigated using a natural regimen of weight loss (if needed), fish oil, vitamins, and brain-enhancing supplements including ginkgo biloba. The positive results could help reverse brain damage in contact sport athletes, alcohol and drug addicts, chronic traumatic encephalopathy (CTE) and people who have had brain damage from concussions. Reports from the National Football League show high rates of violent crime, suicide, dementia, and memory loss among football players. The researchers identified 30 veteran football players who showed symptoms of traumatic brain injury from years of contact sports. They used brain Single Photon Emission Computed Tomography (SPECT) images and a standard neuropsychological test to measure brain blood flow, and cognitive functions. They evaluated the athletes’ mood, memory, language, attention and information speed and accuracy. a brain boosting supplement that included gingko, vinpocetine, phosphatidylserine, acetylcholine (enzyme acetyl-l-carnitine and huperzine A), and antioxidants (alpha-lipoic acid and n-acetyl-cysteine). After an average of six months, the players were re-tested and found to have statistically significant improvement in their brain functioning. In particular, their brain SPECT scans showed increased brain perfusion, especially in the prefrontal cortex, parietal lobes, occipital lobes, anterior cingulate gyrus and cerebellum.The subjects did better on tests of attention, memory, reasoning, information processing speed and accuracy on the neuropsychological test (Microcog Assessment of Cognitive Functioning). Published in the peer-reviewed Journal of Psychoactive Drugs, this study shows that improvements in cerebral blood flow and cognition are possible with a multi-pronged, natural approach to brain improvement. This study demonstrates the value of a natural, nutritional approach to improving brain functioning.